Brit. Fl. Gard. [Sweet] 2: t. 131 (1825). Origin and Habitat: South Africa (Eastern Cape, Northern Cape, Western Cape) to southern Namibia (the Richtersveld, Namaqualand ). Habitat and ecology: Rocky, usually sandstone and granite slopes. Flowering: April-July. Ornithoglossum viride var. undulatum (Willd.) J.F.Macbr. Description: Ornithoglossum undulatum is a very curious cormous perennials 5-20 cm tall with 2 to four channelled, much crisped, blue-grey leaves of up to 10 cm in length clasping the stem. The flowers are bicoloured, nodding and zygomorphic on long pedicels, white to pink with purple or maroon tips, with prominent thread-like stamen filaments which nearly equal the length of the tepals. The tepals are free, narrow at the base. The styles is free, slender and sharply spreading. It is one of the best of the species to grow since it has large, showy and sweetly scented flowers. Derivation of specific name: The specific epithet undulatum relates to the better known wavy or undulating leaf form of the species. Corm: Large bulb-like, solid and covered with a brown shell similar to a Tulip. Leaves: Radical leaves two to four, lance-shaped tapering to a point channelled, lower ones broadest clasping at the base. In the typical form the margins is more or less wavy to crinkly, slightly reflexed of a glaucous colour tinged with a brownish purple at the back. The leaves may also have entire margins that curve neatly upwards, forming a boat-shape (deeply channelled), bringing their margins together as well as recurving towards the leaf tips. The leaves on the scape are smaller narrower and less undulate. Flowers: Few, about 2.5 cm long, nodding and zygomorphic of a fragrance in the evening and at night but without scent during the day. Perianth of 6 tepals sometimes only 5. Tepals narrowly lanceolate, acute, sessile, reflexed a little above the base, the points bending upwards, margins slightly inwards, green marked with purple at the bend: at the base is a nectariferous pit, filled with honey, from which is produced a membranaceous scale, which sometimes simple and acute, and sometimes bifid acute points. The tepals are persistent and markedly tepals in the early fruiting stage from a markedly down-turned capsule. Stamens 6, inserted in the receptacle: filaments divergently spreading, of a curious shape quite smooth, the lower part very slender and filiform white, gradually thickening towards the middle, where it becomes very much thickened, tapering both ways, the upper part again slender, purple, slightly ascending, attached to the back of the anthers, near the middle. Anthers 2 lobed slightly, sagittate at the base. Pollen yellow. Ovary smooth, oval, bluntly 3 sided, 3 channelled. Styles 3, filiform, divergently spreading, about one third longer than the stamens, straight, smooth after being set with the pollen curling up. Stigma a simple blunt point. Fruits: A markedly down-turned capsule. 4) Goldblatt, P. and Manning, J.C. 2000. "Cape Plants: A conspectus of the Cape Flora of South Africa". Strelitzia 9. National Botanical Institute, Cape Town. 5) Nirdenstam, B. 1979. Ornithoglossum undulatum. “The Flowering Plants of Africa” 45: t. 1799. 7) Vlok, J. and Schutte-Vlok, A.L. 2010. 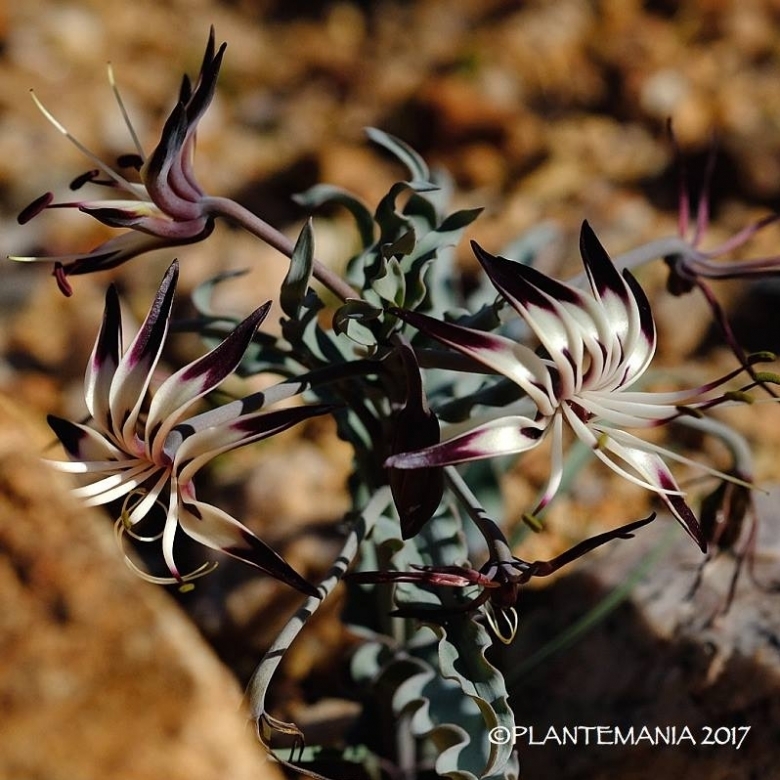 "Plants of the Klein Karoo". Umdaus Press, Hatfield.